Have you ever had someone text or call and say they happened to be nearby and wanted to stop over to say hello? There’s no need to panic, even if your home is not looking its best. I’m sharing my list of 5 essentials to getting your home guest-ready in 15 minutes. Shake off the anxiety spike and then take a quick visual scan of the rooms your guest will use from a non-resident’s perspective. Walk through the door your guest will enter, open the closet and hang up your coat where they do, go stand in the kitchen where they will stand to get a cup of coffee or whatever you’ll offer, use the towel in the bathroom they use, and sit where guests tend to gather. When I step outside of my homeowner haze, I’m surprised at a few quick things I can do to make guests feel welcome and at home inside my home. Resist cleaning beyond wiping off the sink, toilet and anything else you know your guest will touch. Your baseboards and the inside of your fridge can be cleaned later. Remember, your friend is a kind human whose home is probably looking similar to yours. We all have clutter. It’s an everyday struggle to keep the balance between what is coming into the home and going out. It’s part of modern family life to have excess stuff, and battles with clutter. Some days I spend most of my day carrying objects from room to room. But there’s nothing that makes guests feel like they’ve intruded on a personal situation than sitting in the middle of piles of bills, unfinished projects, your child’s breakfast dishes and stuff that belongs in a bathroom or bedroom closet. So the things you are meaning to fix on the front porch could find a quick home in the garage. Clear off counters and side tables so they are ready to receive a drink and snacks. Take a quick pass to put other things inside cabinets, closets or garage. And then take a pass at those “hidden” piles after the guest leaves to see what you really could live without. Even if you don’t think your home has a scent, it does. Every home has a scent. The reason we don’t know our home smells is that we are used to the way our own home smells. At my house, we have kids, a workshop in our basement and two cats. Lighting a candle by the doorway and the sitting area, baking a quick batch of cookies from premade cookie dough, or heating up some vanilla extract in a mug helps make over the scent of a home pretty quickly. If your home smells delicious, then your home will seem cleaner than it might actually be. Humans love color and love to talk about objects that dazzle our eyes. If you have an interesting, bold-colored object displayed prominently, then the clutter piles or other items will fade into the background. Fresh flowers or plants and bright-colored serving dishes or a bowl of fruit will have the same kind of effect. It’s hard to feel like a home is messy when there’s a giant bowl of beautiful oranges placed in an interesting bowl on a clutter-free table. Depending on the time of day and the season, lighting can be a powerful tool to create a mood and enhance any space. When it’s your family at home, you probably use the lighting in a different way than if you have a party. There’s a reason why restaurants use candlelight on tables and dim the lights for dinner service. Low lighting gives a more intimate feeling. Bright lights give a more sterile — think dentist’s office — feeling. And the brighter the light, the more you can see the “everything” you might not want a surprise guest to see. I always turn off the overhead lights that don’t have dimmers, and switch on a few decorative lights and light candles. Lighting, color, clutter and scent have a powerful effect on people. I’d recommend a practice run-through just to get your strategy down, so the next time your friend texts that she’s popping over, you are ready in 15 minutes or less. 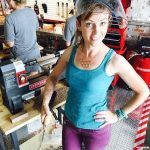 Author, speaker, designer, mom, and all-around maker. From yarn arts to home improvement to upcycling, she loves finding the easiest, lowest cost, and most fun solution to any design and DIY dilemma.